Heating water accounts for 23% of the energy used in an average home and is mostly used in the bathroom, kitchen and laundry. It takes a lot of energy to heat water, so when you use hot water you’re paying two costs – one for the water you use and another for the energy to heat it. If your water heater is old and needs replacing, you should consider the ongoing running costs as well as the purchase price when choosing what to buy. Choosing an efficient model with lower running costs could save you money overall. In an average South Australian home, 60% of the water used indoors is for the bath, shower and laundry. installing your water heater as close as possible to your bathrooms, kitchen and laundry to reduce the amount of heat lost through pipework. If you have an instantaneous water heater with an in-home temperature controller, turning your hot water temperature down a few degrees and taking a cooler shower will save you energy. If you have a storage water heater, the stored water must be kept at a minimum temperature of 60oC. Lower temperatures may allow harmful bacteria (Legionella) to grow, while higher temperatures use more energy. If you have concerns about your water heater temperature, ask a plumber for advice. Some shower heads can use up to 25 litres of water a minute. By changing to a more efficient shower head that uses 9 litres per minute or less, you'll save on your water and energy costs. cup or jug with volume markings. Step 1 – Turn the water on full and let it flow into a bucket for 10 seconds. Step 2 – Use the cup or jug with volume markings to measure the amount of water collected in the bucket in litres. Step 3 – To determine the flow rate in litres per minute, multiply the amount of water you collected in 10 seconds by 6, eg if you collected 1.8 litres in 10 seconds, 1.8 x 6 = 10.8 litres per minute. If your flow rate is more than 9 litres per minute, consider installing a three-star rated efficient shower head. Find out how to calculate your shower flow rate and use water efficiently to save on your water and energy costs. South Australia has water heater requirements that may affect the type of water heater you can install. There are different types of water heaters. 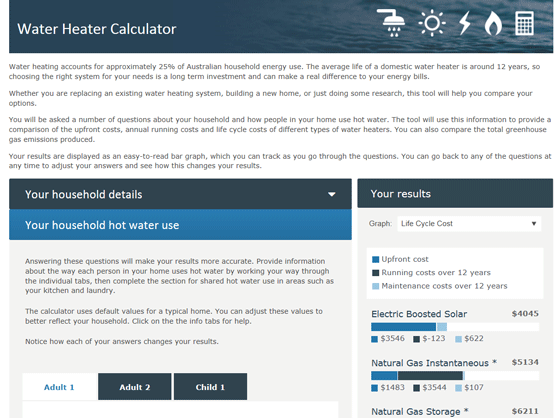 The Australian Government’s YourHome website explains what electrical, gas and solar hot water systems are and how they work. Choose a water heater that best suits the size of your home (eg how many people live in your home, how many bathrooms there are) and think about the space available to install a water heater. A manufacturer or supplier can give you advice about the right size water heater for your needs. If you’re thinking about buying a solar hot water system, you’ll need sufficient north-facing space on your roof that isn’t shaded by trees or buildings. If the system has a tank on the roof, you’ll need to ensure your roof structure is strong enough to support it. If you are buying a heat pump system that can operate in lower temperatures, consider having it connected to the off-peak electricity meter. Off-peak electricity tariffs are typically lower than peak tariffs. Installing a day/night switch will allow you to run the water heater overnight in warmer months, and during the day in cooler months. Before you buy, read consumer reviews and guides, get a number of quotes to compare your options and look for any special offers or payment offers that could help lower your upfront costs. Use a licensed tradesperson for all plumbing, gas and electrical work needed when installing your new water heater. You may need more than one tradesperson to install a water heater. Make sure you receive a certificate of compliance from each trade as confirmation that the installation has been tested and complies with relevant safety standards. Water heaters last for many years, so it’s important to consider the ongoing running costs as well as purchase price. While some efficient models may cost more to buy, they may cost less to run and therefore save you money in the long run. Some retailers let you pay for your heater in instalments, meaning you don’t need to have as much money available upfront – see assistance with purchase costs below. Use our interactive water heater calculator to find the most appropriate type of water heater for your home. The calculator helps you compare up-front costs, annual running costs, life-cycle costs and greenhouse gas emissions produced by different types of heaters. Installing an eligible solar or electric heat pump water heater entitles you to Small-scale technology certificates (STCs). Each STC represents an amount of electricity in megawatt hours generated by the system over the course of its lifetime (up to 10 years) that offsets what your home would otherwise draw from the main electricity grid. The more electricity your system can displace, the more STCs you will get. The STCs act as a form of currency and can be sold to recoup a portion of the cost of purchasing and installing the system. The most common way of selling STCs is by getting a point of sale discount on your new system from your retailer or installer and assigning the STCs to them. For further information about STCs and to find out how many your new water heater could receive, see the Clean Energy Regulator's website. Ask your water heater supplier if they offer any repayment plans that suit your needs. Some suppliers offer finance options, so you can install your water heater now and pay it off over time. This can help you manage the initial capital cost of the water heater and may mean you can consider alternative water heater options. NILS provides fee-free interest-free loans for people living on a low income. Loans can be used to purchase essential household items, like hot water systems, and are typically repaid over 12 or 18 months. For eligibility, further information and a list of loan providers, visit the NILS website. Use and maintain your water heater as recommended by the manufacturer to ensure it is safe and runs efficiently. Use a licensed tradesperson for all plumbing, gas and electrical work needed to maintain your water heater. If you have a gas water heater, ensure air can flow freely around the unit and keep the area around the heater and flue free of combustible materials, aerosol cans and chemicals.